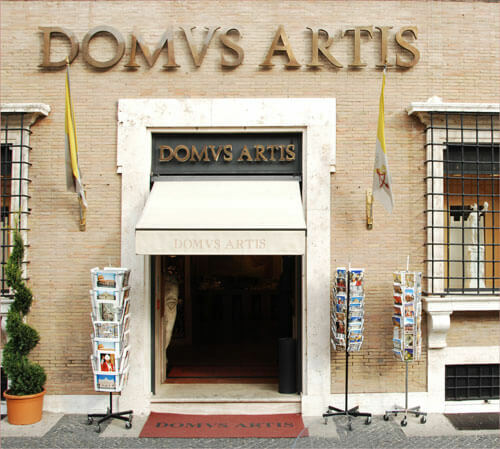 Domus Artis is a religious articles and souvenir store in Rome. with the Vatican, built in the early years of 1900, inside the historical Rusticucci Palace, built for Cardinale Rusticucci in 1585. Today Domus Artis is runned by Raffaella and Stefano Rossetti. They descend from an ancient roman family since 1850, always dedicated to commercial activities regarding religious objects and jewellery. Because of its closed position to St. Peter’s Square, Domus Artis offers to its clients luxury spaces in which they can spend relaxing time after their visit to the Basilica and the Vatican Palaces. Domus Artis was already there in the ancient part of Rome called Borgo before the construction of Via della Conciliazione, nearby the former square Piazza Rusticucci. This square was the dead end of two streets: Borgo Vecchio and Borgo Nuovo, marking the edges of the ancient agglomerate of buildings called “Spina dei Borghi” (Burgs Aculeus) because of its craned form. Once, this zone was a part of Via Cornelia (Cornelia Street), the access street to the Nero Circus, today below St. Peter’s Basilica.It was the meeting point of the Vatican’s Noble Guards and of famous people like Edmondo De Amicis, the poet Trilussa, Gabriele D’Annunzio and a lot of great names of masters and politics.